As January ends we sadly must bid adieu to our our January Leading Lady Greta Hess. The last few weeks with Greta has been a spotlight for her excellent design, mastery of composition and terrific techniques. Greta has exhibited her tremendous talent and astounding creativity week after week. I feel so fortunate Greta shared her talents with us this month and made this month something special. If you missed her smashing debut you must see it...CLICK HERE or her sensational second performance showcasing her oh-so-clever coloring methods CLICK HERE or her triumphant third performance highlighting a tremendous trio of cards showing off a wonderful design element that adds just the right amount of drama CLICK HERE! Today's projects add just that extra bit to make them shine! I'm thrilled to be back with my Final Performance as the Winnie & Walter January Leading Lady. It's been a huge honor & I can't thank Shay enough. I love shimmer & shine including foil. For my final 3 cards I thought it'd be fun to show you ways to add foil without using a laminator. First up is a festive birthday card with a rainbow color scheme. 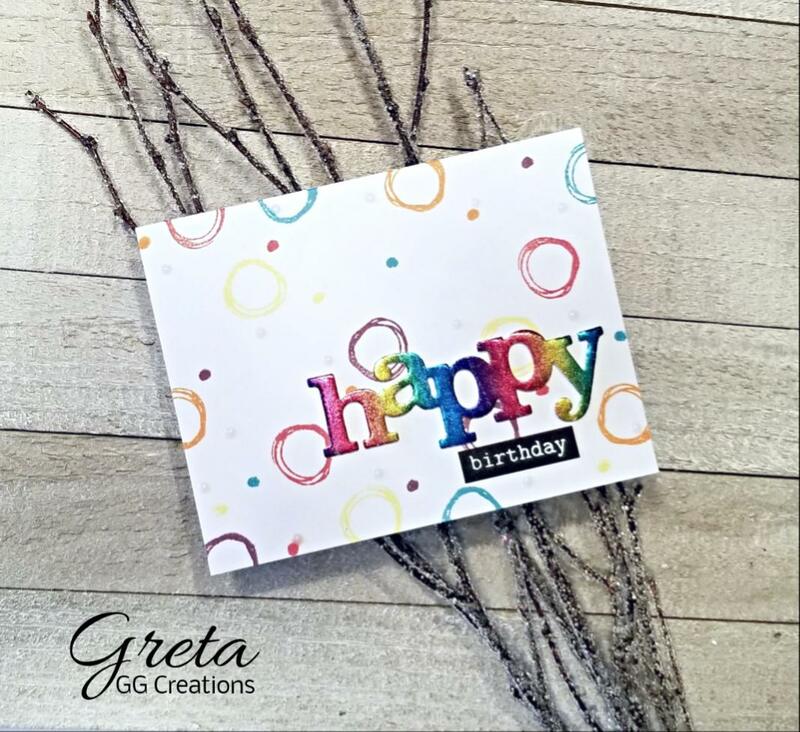 I stamped images from Scenery: Dotty on the card front using a variety of Distress Inks that match the rainbow foil. The In a Word: Happy Cutaway was die cut from self-adhesive foam so that the adhesive was on the top. Then the foil was pressed onto the word & carefully peeled back to reveal the gorgeous results! This really is my favorite way to use foil--super easy & fun! The little word from The Big, the Bold & the Happy was white embossed on a black scrap & trimmed into a label. I added a scattering of shimmer dots for embellishment. 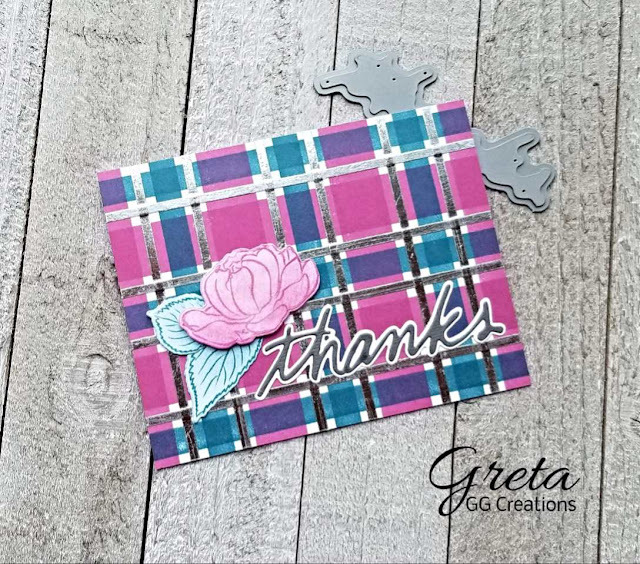 For the next card I first made a plaid panel using 2 images from Scenery: Stripes stamped in Memento Lilac Posies & Teal Zeal. Then I added strips of 1/8 inch score tape going both directions & pressed silver foil onto the adhesive. I love how it totally changes the look! 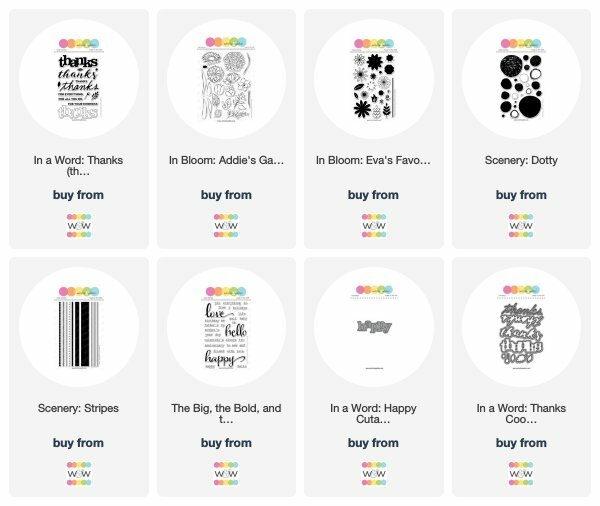 The bloom & leaves from In Bloom: Addie's Garden were die cut, stamped & brushed with the same inks. I also used a shimmer pen on the bloom & attached it with foam tape. For the sentiment I used In a Word: Thanks Coordinating Cutaways. The shadow was cut from white cardstock & the word from a medium gray. I like how it stands out, but doesn't compete with the silver foil. To finish up I made my most common type of card & that is one to keep in touch with a friend. I began by randomly stamping flowers from In Bloom: Eva's Favorite Flowers in 3 warm ink shades. I added the dot from the same set using kraft ink. Then I used my Quickie Glue pen to make dots in the flower centers. When they turned tacky, I pressed on gold foil. Almost looks like designer paper with foil accents, don't you think?! I stamped the words from The Big, the Bold & the Happy in dark brown ink. Originally it was a one layer card, but I decided to add a gold foil frame. I cut the panel down slightly & brushed the edges of the card front with Flitter Glu. When it dried to a tacky finish I pressed on the same gold foil & attached the floral panel. The frame could also have been done using 1/4 inch Score Tape. I hope you've been inspired in some way by my projects this month. 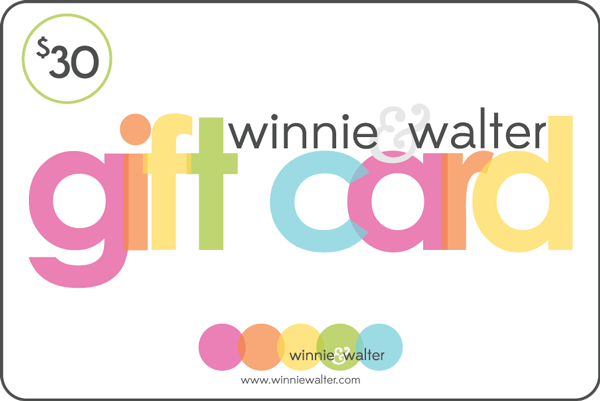 Winnie & Walter has given me a $30 gift certificate as a prize for the random drawing I'm doing on my blog. 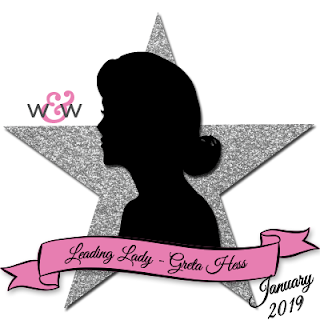 Be sure to stop by each of my Leading Lady posts to be in the running. 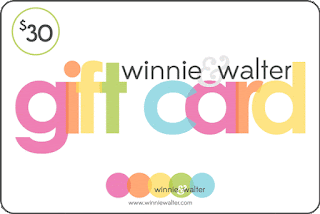 Thanks again to Shay for having me & I look forward to seeing all your Winnie & Walter projects in blogland. Great ideas for adding foil! Pretty cards! Great finale! I love the colors! So pretty with the foiling. Love the rainbow colors on the first one. 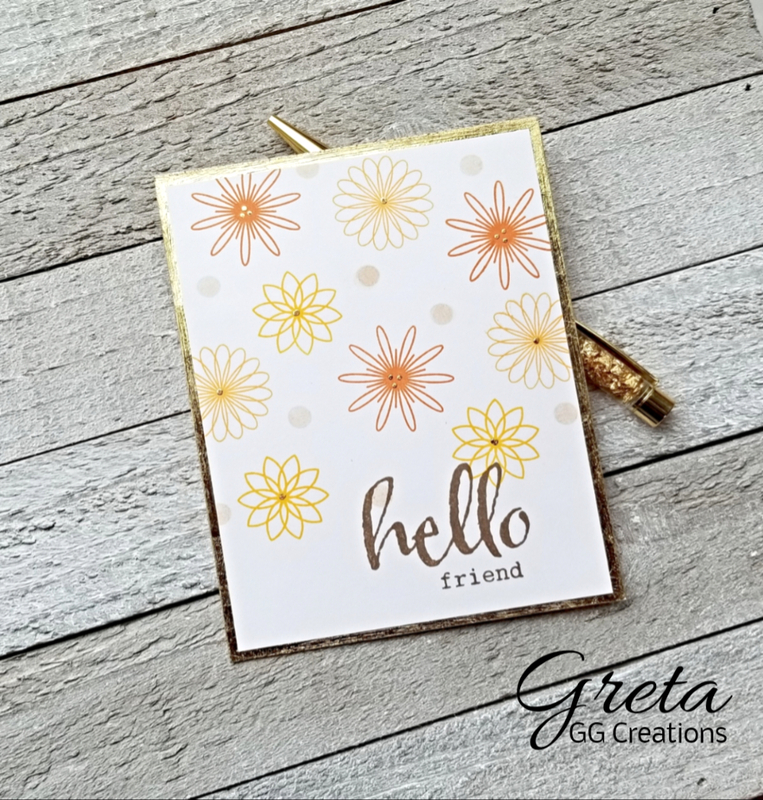 What a treat it's been to see Greta's beautiful work here! This fabulous trio is the perfect finale. Thanks for the tips Greta! Greta, they are fabulous cards. Great designs. Thank you for sharing these three ways to use foil. The first card looks amazing and what pretty colours of foil and a great technique. Love the plaid and the pop of pop sure does make a difference. Such a pretty third card, which really does look like designer paper. Thank you for all your wonderful inspiration during this month...You are one creative lady x. Beautiful cards with the glimmer of foil! My inner crow loves anything shiny, so these really speak to me. I have so enjoyed seeing Greta's projects this month!!! Gorgeous cards Greta. Your work has been stunning.